The Title Conditions (Scotland) Act 2003 was passed during the first Scottish Parliament. It codifies the kinds of restrictions or burdens that can be included in titles to land and property. Among them is something called a conservation burden that can be used to protect aspects of the natural and cultural heritage. One of the bodies allowed to impose such burdens is the National Trust for Scotland (NTS). 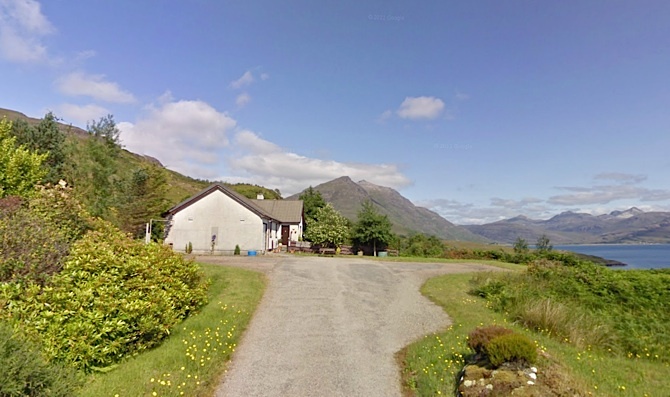 Helen Finan owns a croft in the village of Inveralligin in Wester Ross. She inherited the croft from her mother, Donaldina Maclean Finan who passed away in 2011. The croft has been in her family since before the 1886 crofting act. Her great-grandfather’s family was a victim of the Highland Clearances. Helen moved to the croft in 2009 to nurse her mother in the last two years of her life. In 2006, Donaldina had decrofted (removed from crofting tenure) the house and garden. Later, in 2009 she exercised her legal right to acquire the whole croft and, in so doing became an owner-occupier crofter. Under the crofting acts, if the croft land is sold to anyone who is not a member of the crofters’ family within 10 years of being bought, the landlord is entitled to clawback 50% of the difference between the open-market value and the price paid to acquire it. This condition relates only to the croft land and not to the dwelling house. Helen is content with this statutory condition. This blog is not about the croft-land. It is about the house and garden which Helen now owns outright. The house and garden are shown bounded in blue in the title plan above. 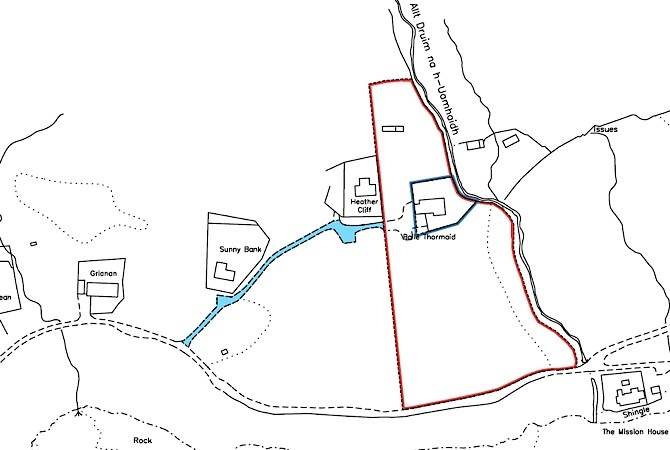 The croft-land is the remaining land bounded by the red line. The burden requires the consent of NTS for the following. – any internal or external alterations. – the garden be kept in a neat and tidy condition. Helen and her late mother have done a very good job abiding by these conditions. 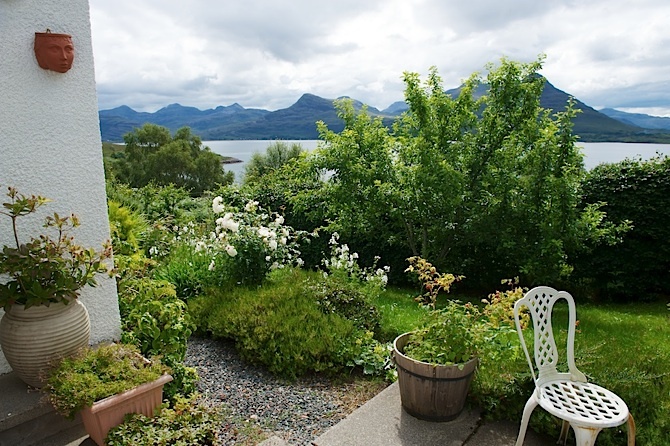 Helen is not in a position to reside permanently in Inveralligin and thus she wishes to sell the whole croft. But she faces a problem because the potential buyer has been advised that the burden will make it difficult to re-sell the property in future. The croft house is now difficult to sell and leaves Helen in a tricky position. She cannot live and work there as there is no work. She cannot let the house because that contravenes the conservation burden and it looks like she may not be able to sell it. Her future is in the hands of the NTS. I understand that others are in a similar situation. Now it may or may not be desirable that the owners of such properties be compelled to live in the house they own. Indeed Section 33(2) of the Crofting Reform (Scotland) Act 2010 insists that crofters should live within 20 miles of their croft (though this do not apply to the croft house if it is sold independently from the croft). The issue here is not the desirability or otherwise of such conditions but whether it is appropriate or even lawful for the NTS or any other private body to impose and police them. Helen has therefore applied to the NTS to waive the conservation burden. The application was considered by the NTS’s “Conservation Agreement Scrutiny Panel”. It decided that it was willing to grant the waiver in respect of the residency condition but that all other conditions (the colour of the house etc) remain in place. But the panel placed a condition on the granting of the waiver viz. This is a quite breathtaking statement. The only reason the croft house is devalued is because of the conservation burden which NTS imposed and in exchange for waiving the burden, NTS wants to be paid a substantial sum of money! The problem with the approach of the NTS is that it is not clear that the conservation burden is lawful in the first place. In 2002, the NTS argued for such burdens in written and oral evidence to the Scottish Parliament and made no mention of any wish to become involved in social engineering of any kind. What architectural, historic of other (flora, fauna etc.) characteristic of the land is preserved or protected for the benefit of the public by insisting that the owner of the house shall use it as their main residence and for no other purpose? Whether someone lives in a house or not bears no relation to any characteristics of the land. In this instance an absentee conservation landlord is seeking to impose its values and will on another property owner who stands to be disadvantaged as a consequence. Is this right? It would be interesting to see what the Land Court or Lands Tribunal for Scotland would make of of this question if it were to be presented to them given both the question over the legitimacy of the conservation burden and the more general conflict arising between the rights of crofting tenants under the law and the aims of the NTS. (1) Of course the conditions of sale were accepted by Helen’s late mother. Had she not accepted them, she may have had to go to the Land Court to contest them. She was ill and in the last two years of her life. On a reasonable interpretation of the circumstances she appeared not to have had a great deal of choice in the matter. Am I interpreting this correctly to say that the NTS could insist on conditions that would result in an effective imposition of a 50% penalty in the value of the house but for waiving this they want a penalty anyway? So Helen effectively gets 75% value of her house and the NTS gets a 25% tax payment on it for doing the square root of niente? NTS asking for 50% of uplift which = difference between value with burden removed and value with it in place. If that uplift is 50% then your figures are correct but we don’t know that it would be 50%. It might be 30%. it might be 80%. Gotcha – I was assuming removal of conditions would lead to full value – which it may not. Thanks. Very interesting case, Andy, thank you very much for making it public. It seems to me one of the increasing examples where crofters’ rights collide with those of “charitable” bodies, not just the NTS, but also the John Muir Trust and the Scottish Wildlife Trust etc. whose administrators and trustees are completely removed from the realities on the ground. They cream off vast amounts of public money and like to involve themselves in shady deals that, on the surface, concur with the land reform agenda and the latest revisions of the crofting legislation but undermine inreality a lot of what crofters have gained through the 1976 Act. Andy. I’m not sure that I fully agree with you. Although you are correct in asking what conservation measures are supported by this burden, perhaps that’s not the only question that should be asked. The wider point that the NTS’s position makes is that before they released the burden, they were protecting the area against the threat of depopulation caused by second home-owners. In releasing that burden, it’s true that the NTS will make money out of this. However, they might argue that any such money will assist them offset depopulation issues through their use of the money in some other way on the estate. The owner occupier’s mother would have had full legal advice on purchase and the original purchase price would probably have reflected the burden. I don’t think that anyone is losing through this. I am not putting at issue the question of whether residency conditions are a good idea or not. I am questioning whether the conservation burden is lawful in the first place. As for value, the crofting acts allow purchase for 15 times annual rent. The croft was acquired for £750. Bear in mind the whole value of the croft belongs to the tenant and their century and half of work including building a whole succession of buildings. The landlord is entitled to virtually nothing which is as it should be. I should add that I have always been in favour of making residential occupation and holiday lets two separate use classes so that planning consent would be required to change from one to the other. This has been mooted at various times but got no traction. But, as I say that is not the central point being put at issue, namely the proper use of conservation burdens as Parliament intended. That would permit Helen to let the house but without allowing it to escape into the second home market (unaffordable for locals) or allow it to be lost to the local housing stock by being converted into a holiday let. (1) – is it definitely a conservation burden as opposed to an ordinary “vanilla” burden in favour of the NTS as the owners of the surrounding estate? That should be apparent from the Land Certificate. (2) – assuming it is a conservation burden (CB), I don’t read s.38 of the TCA03 as requiring that the land burdened by the CB be the land to be protected by it. In other words, the burden is not to protect the characteristics of Helen’s house, it’s to protect the characteristics of the surrounding NTS Torridon estate. However, that’s a tentative viewpoint on the legal interpretation and maybe someone like Malcolm Combe might want to come in on that point. But I didn’t read the blog on that narrow legalistic sense. Like, I suspect, the other commenters (Paul, Reiner, Jim) I read it as a comment on the propriety of a charity estate owner lording it over its crofters with burdens. Maybe it’s high time a charity did impose restrictions on land it sells off to keep houses out of the second home/holiday let market? There are a whole host of these bodies, starting with Scottish Nature, Forestry Commission, national Trust, etc etc…they all have a breathtaking arrogance and a total lack of respect for democracy, and people’s rights. I have come up against them on my search for a suitable farm for use as a research station on green issues and farming. They operate as autonomous semi-state entities, with huge land holdings, thousands of officials, and a complete contempt for any kind of law that might restrain their operations. They also have a totally colonial mentality towards the local “Natives”. They are a sort of hold-over from pre-devolution days, when they could do as they wanted. They certainly need a huge shake-up. My latest problems are from the Forestry Commission, who operate in the same high handed manner as the others. As usual, the issue is land. The control, use, and value of land is a fundamental method of social and political control in Rural areas, and the Commission operates in a seamless web with Scottish Nature, National trust, etc, to exert Rural Hegemony. This particular case is just a small example of the web of social and political control. The Forestry Commission is also, like all the others, deep into social engineering. They have many farm holdings. In many cases, they have operated a long term policy of allowing such properties to fall into disuse, refusing leases, or not previously renewing them, and allowing the properties to decay. Eventually, they bulldoze down the farm house, knock down ancient field walls, and obliterate the old farm. Some of these properties have been farmed since the Neolithic. Some houses are up to 800 years old. No matter. In Galloway, I have discovered that the Commission has at least 30 disused farms, covering a large area, previously used for sheep farming, that it is steadily trying to obliterate. It seems to have a campaign to do this all over Scotland. Why?…….I mention this as it fits to the policies of the NTS, and SN, who act in unison, and almost by stealth, to carry out this program. In Galloway, any attempt that has been made to use the properties for community use, as set out by law, has been treated with utter contempt by the Commission. When they do not get their own way, they simply break the law. I write all this, so as to set into context, the hidden cross links, that allow this conglomerate, who function almost as a “State within a State” to carry out their mission of hidden social Hegemony. It is pernicious, and evil. it means that the Edinburgh Parliament has been deprived of democratic oversite and control of the countryside, by stealth, and a cats cradle of laws and regulations that strangle at birth all attempts at social, political, and economic change. Look much wider, and see these cross links. Scotland has two Governments. One is public, and in plain sight. One is a hidden parallel state that does as it pleases, and is under only partial control of the Parliament. Nothing short of a Maoist uprising will shift it now, and that is not going to happen. Graham – I can’t comment on your details on FCS farm holdings in Galloway as I have no direct knowledge of them. 1. Is the original purpose of the burden still valid? s38 as described above suggests that it may not be. 1. On balance, is the burden on her greater then the benefit to the National Trust? Potentially, the Trust may find it hard to argue a commercial uplift if they cannot link it to the original purpose of the burden as set out in s38. 3. Is she willing to offer compensation? One of the main benefits of the Tribunal for her is their approach to compensation as they have rejected previous attempts to link compensaiton to any ransom value. See George Wimpey (http://www.lands-tribunal-scotland.org.uk/decisions/LTS.LO.2004.19.a.html). In the event that she was asked to pay compensation – which is not obligatory, if the Tribunal ordered compensation to be paid she doesn’t have to pay it, the Tribunal will just hold back their order for variation or discharge until she does pay (if ever) – I would expect it to be less than currently required. This assumes though that the Trust would object to the application – if they don’t then 8 weeks after she submits the application the Tribunal would grant it automatically if no one objects. 4. The short length of time since the burden was imposed could count against her, agreeing a condition in 2009 and then varying it four years later may not be viewed as ‘the done thing’. The length of time since the condiiton was created leads me in the caveat I mentioned earlier. In the original disposition the Trust can impose a condition that no applications can be made to the Tribunal for a period of up to five years. Before considering the Tribunal in depth check she’s not caught by one of these clauses as, if so, it may be 2014 before she can do anything. Co-author of The Lands Tribunal For Scotland: Law & Practice. The village of Inveralligin is a permanent home to only 33 people today. It is no longer a working croft community. As far as I am aware only 5 residents work, the others are retired. The nearest Primary School is 15 miles away and the nearest Senior School 40 miles away, making it a difficult place for families to bring up children. The National Trust for Scotland has been the landlord since 1967. While the beauty of the place, the flora and fauna have been protected by them, NTS have done nothing to make this a viable place for young families to live and work. It is true that the area attracts many visitors, and some residents are able to earn a little extra by offering bed and breakfast accommodation. Other part-time residents rent their properties to holiday makers. Without these services the area would attract fewer visitors and the second homes would become derelict (like Craigloiste, an original croft house, currently owned by NTS). The NTS has been inconsistent in its approach to crofters who have bought their land. Some owner crofters have had the clause referring to their home being their main residence without the possibility of using it for letting purposes waived without financial penalty, others, like me, will have to argue the case and pay the price. Surely a section 75 would cover the use of the cottage to local people only. Its high time that tenant farmers got to buy for 15 times the rent. That is a very good idea and a very large proportion of tenant farmers totally agree with your comment .